To me, the quintessential New York City food item is the bagel. This unique bread product was by no means invented here (thank you so much, 16th century Poland), however we have certainly taken many steps to make them as delicious and widespread as possible. At the end of a lovely Saturday evening spent watching “Hereafter” and making CHOW’s microwave mug brownies, I quickly mixed together the overnight sponge for the bagels. 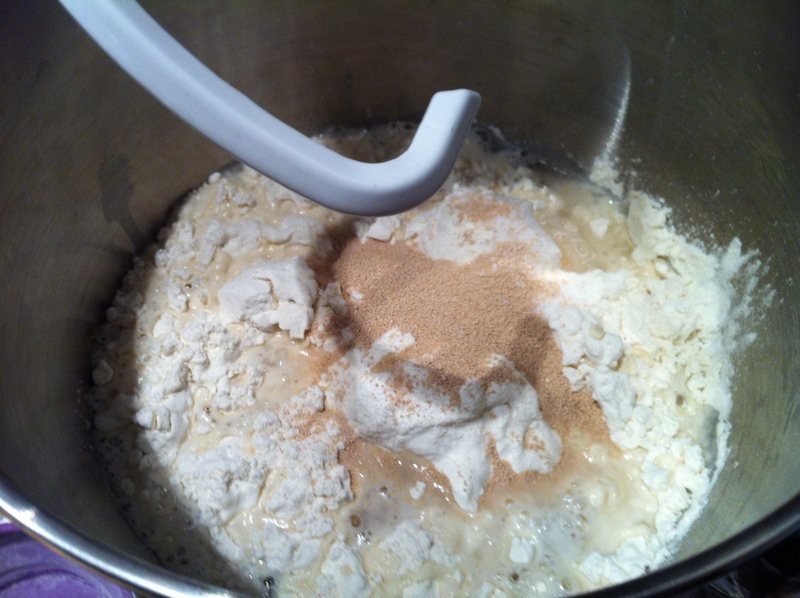 I followed a recipe from King Arthur Flour — which can also be found on their blog, Baker’s Banter. The next morning (at 6 AM ugh, as I had guests coming over for a bagel tasting at 10:30) I combined the starter with the remaining ingredients. If you have a bread machine or stand mixer with the dough hook attachment (I used the stand mixer) great, if not, you can totally mix and knead by hand. After the dough has come together in a nice smooth ball, put it in an oiled bowl to rise for about 1 hour. After an hour, punch the dough down and let it rise for an additional 30 minutes. 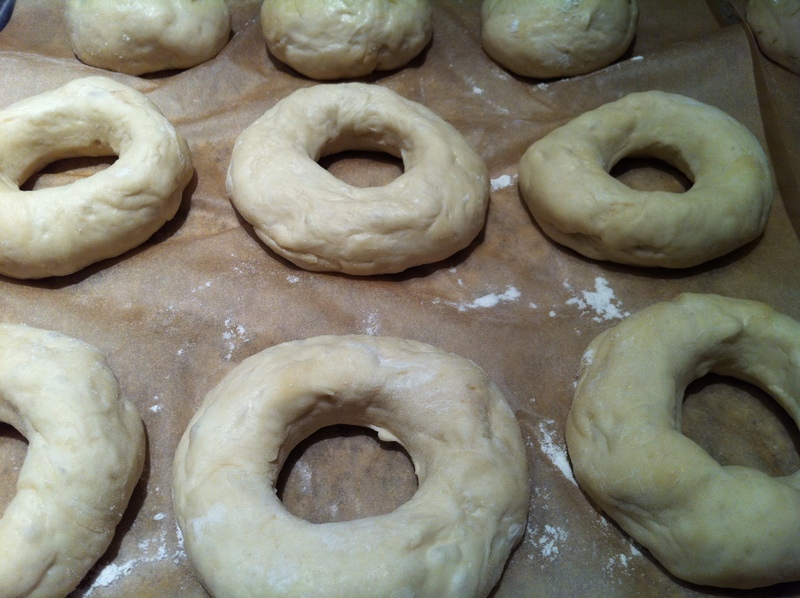 Then it is time to divide the dough into bagel sized pieces – if you have a kitchen scale you can weigh the entire dough ball, and figure out how much each of the 12 smaller dough balls should weigh – mine were 3 oz each. Allow these to rest and rise for 30 minutes. Plenty of time to run to the store to pick up the poppy and sesame seeds you forgot to purchase the day before. Now for the fun part, shaping the bagels! Before you start, preheat your oven to 425 F, and get a pan of water + 1 tbsp malt powder or brown sugar (at least 1 inch deep) boiling on your stove. Poke a hole in each roll with your finger, and stretch it out until it is about two inches wide. 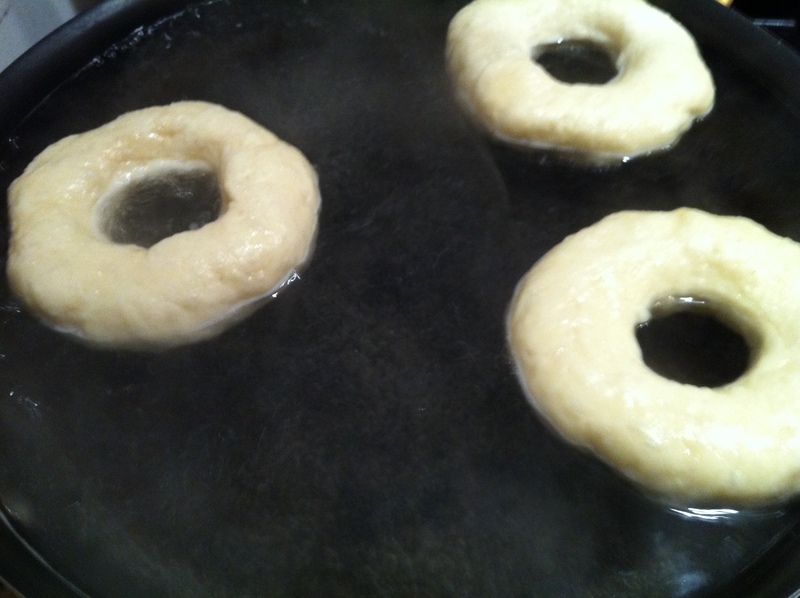 3 or 4 at a time, drop your formed bagels into the pan of boiling water and let them cook for 2 minutes, then flip and cook for 1 minute more. Place them on a parchment-lined sheet pan and bake for 15 minutes. If you want to put seeds on them, brush with water or special seed-sticking spray, sprinkle the seeds on, and cook for an additional 10 minutes (bake for the full 25 minutes if you aren’t adding seeds). 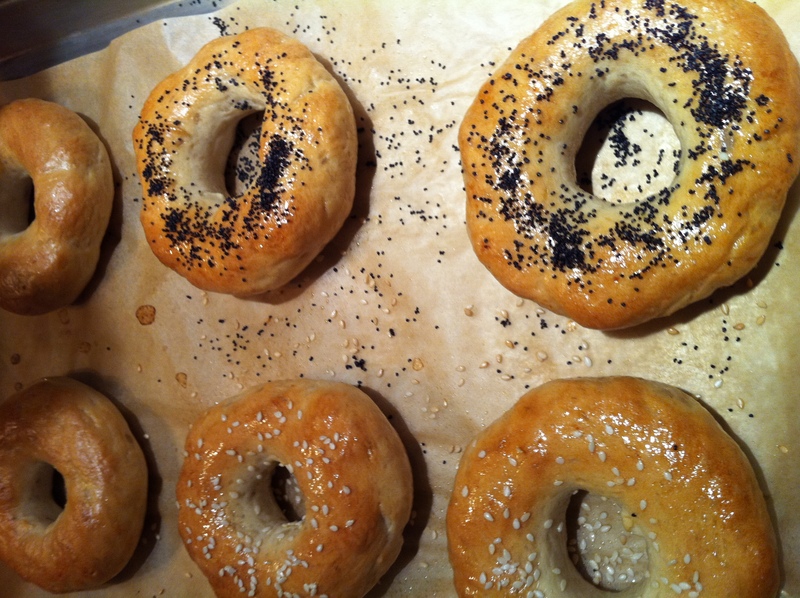 Cool the bagels on a rack, then slice, load up, and enjoy! 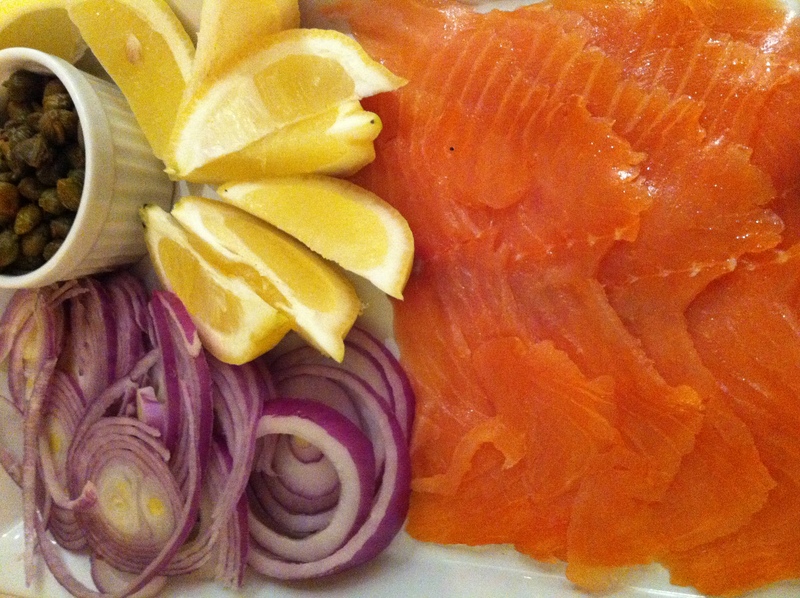 We made a nice lox/onion/caper tray and several flavored cream cheeses to accompany these. SO delicious and surprisingly easy to make! 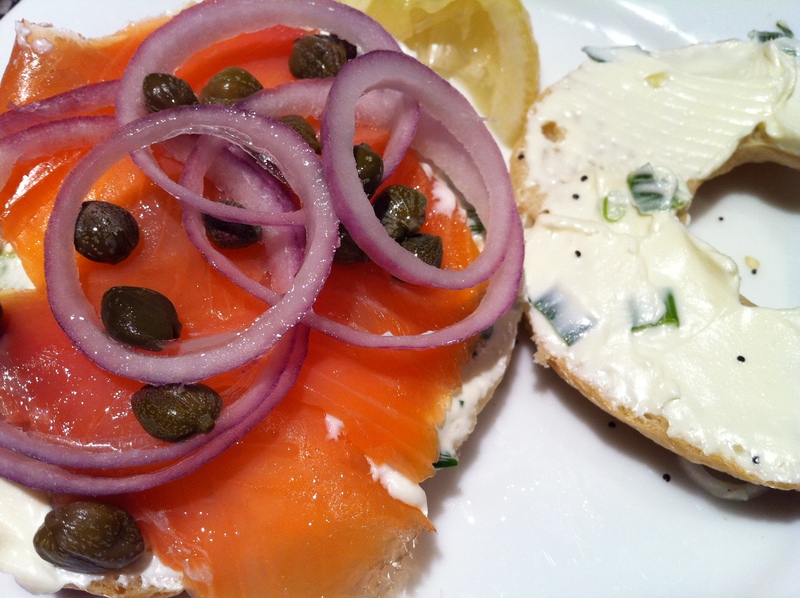 This entry was posted in City Classics and tagged bagel, bake, boil, breakfast, capers, cream cheese, lox, New York, red onion. Bookmark the permalink.